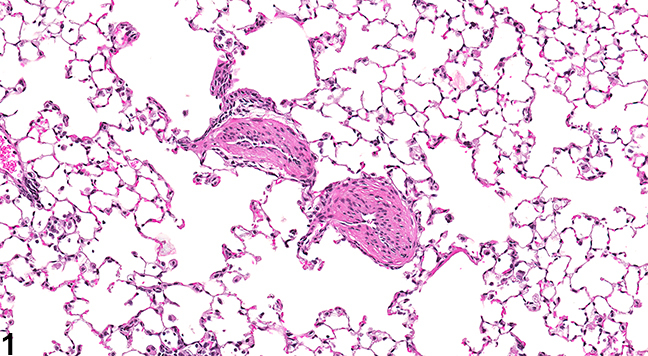 Lung, Artery - Hypertrophy, Medial in a male B6C3F1/N mouse from a subchronic study. The tunica media of two small muscular arteries is thickened. 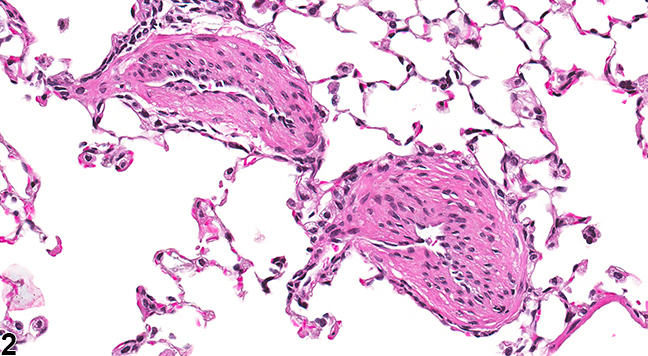 Lung, Artery - Hypertrophy, Medial in a male B6C3F1/N mouse from a subchronic study (higher magnification of Figure 1). Medial hypertrophy of two small muscular arteries is apparent; note the lack of inflammation. Arterial medial hypertrophy is characterized by circumferential thickening of the tunica media of arteries ( Figure 1 and Figure 2 ) that often results in narrowing of the vascular lumen. Thickening is caused by concentric layers of hyperplastic and hypertrophied smooth muscle cells, along with increases in collagen, elastin, glycosaminoglycans, electrolytes, and water. Although increases in connective tissue of the tunica adventitia may also be noted, the predominant finding is smooth muscle cell hypertrophy and proliferation. Medial hypertrophy is most often noted as a secondary response to hypertension from various etiologies (systemic or associated with chronic renal disease) and occurs in both large and small muscular arteries. The lesion is uncommon as a spontaneous finding in laboratory rats, even in the case of severe chronic progressive nephropathy. It may occur occasionally in overloaded collateral arteries adjacent to areas of vascular occlusion. The lesion is most important and most commonly seen in hypertensive rat strains (SHR) and in other created models of hypertension. Induction of hypertension in rats has been achieved through various means, including chronic hypoxia, hyperoxia, and monocrotaline injection. Decreased kidney function through radical nephrectomy or arterial restriction also results in hypertension and medial hypertrophy in rats. Many diabetic rat strains also develop hypertension and are used as such (e.g., SHR rats administered streptozotocin, Cohen-Rosenthal diabetic rats crossbred to SHR rats, and obese Zucker rats). The Dahl/Rapp salt-sensitive rat is yet another strain that develops hypertension, which can be titrated through the amount of salt added to the diet. In mice, medial hypertrophy is occasionally noted in the small and medium muscular arteries of the lungs and may be secondary to pulmonary hypertension. Inflammation is rarely associated with these lesions; however, hypertrophy and thickening of the vascular wall often accompany cases of inflammation in the lung. This type of inflammation is not typically diagnosed as a separate lesion. Whenever present, medial hypertrophy of arteries should be diagnosed and graded based on the extent of the lesion (e.g., number of arteries affected, length of vessel affected) and severity of the lesion (e.g., degree of thickening, percentage of luminal occlusion). The organ in which the lesion occurs should be listed as the site, and the type blood vessel affected (e.g., artery or vein) should be indicated as a site modifier. If the type of blood vessel cannot be determined, the site modifier "blood vessel" may be used. Lesions in protocol-required great vessels, such as aorta, should be recorded with the blood vessel as the site (e.g., Aorta - Hypertrophy, Medial). The inflammation associated with vascular thickening in the lungs of mice is not typically diagnosed as a separate lesion, unless warranted by severity. Altiere RJ, Olson JW, Gillespie MN. 1986. Altered pulmonary vascular smooth muscle responsiveness in monocrotaline-induced pulmonary hypertension. J Pharmacol Exp Ther 236:390-395. Csiszar A, Labinskyy N, Olson S, Pinto JT, Gupte S, Wu JM, Hu F, Ballabh P, Podlutsky A, Losonczy G, deCabo R, Mathew R, Wolin MS, Ungvari Z. 2009. Resveratrol prevents monocrotaline-induced pulmonary hypertension in rats. Hypertension 54:668-675. Doggrell SA, Brown L. 1998. Rat models of hypertension, cardiac hypertrophy and failure. Cardiovasc Res 39:89-105. Ehrhart LA, Ferrario CM. 1981. Collagen metabolism and reversal of aortic medial hypertrophy in spontaneously hypertensive rats treated with methyldopa. Hypertension 3:479-484. Elwell MR, Mahler JF. 1999. Heart, blood vessels, and lymphatic vessels. In: Pathology of the Mouse: Reference and Atlas (Maronpot RR, Boorman GA, Gaul BW, eds). Cache River Press, Vienna, IL, 371-372. Harmon KJ, Couper LL, Lindner V. 2000. Strain-dependent vascular remodeling phenotypes in inbred mice. Am J Pathol 156:1741-1748. Owens GK, Schwartz SM, McCanna M. 1988. Evaluation of medial hypertrophy in resistance vessels of spontaneously hypertensive rats. Hypertension 11(2):198-207. Zimlichman R,Zeidel L,Gefel D,Barg J,Shahar C,Nakash Y,Matas Z,Gass S,Eliahou HE. 1995. Insulin induces medial hypertrophy of myocardial arterioles in rats. Am J Hypertens 8:915-920.